If last week I did something crazy, this week I did something totally illegal. Yes, I broke the law. I bought and drank pet milk. Alternatively known as raw milk. Inspired by the Real Food book by Nina Planck, I've been itching to get my hands on high quality raw milk for ages, and found myself considering the idea of getting a house cow. However quietly asking around for a regular supply, this week I finally found it. "You're allowed to buy cigarettes but you're not allowed to buy this. It's not for human consumption - only for pets" stated the source of my illegal booty. I couldn't help ponder this absurd state of affairs as I drove straight home and poured myself a glass. It tasted so sweet and delicious and unlike any milk I've ever tasted. It was so good I had to pour it over a bowl of granola and promptly gobbled that up too. The big test was going to be if the peeps drank it, because really, I want them to enjoy the health benefits that raw milk provides. Having never liked drinking milked before, they almost polished off two litres last night and this morning. Law broken again. But I was smug in the knowledge that their tummies were full of vitamins, enzymes, fatty acids, beneficial bacteria and a host of other goodness that crime seems a small price to pay. The virtues of clean raw milk sourced from grass fed cows are extensive, and there's plenty of information around if you look. Both for and against. It's a complex issue that I won't explore here. What I am looking forward to is making yoghurt, butter and fresh cheeses. All for my pets of course. I wouldn't to be involved in any illegal activity. We get both raw goat and cow milk here and are so thankful for it. Yes, raw milk is easier to digest. I am lactose-intolerant, but I have no problems with raw milk. And making all the other healthy, nourishing foods is a big bonus! My boys loved helping make paneer. So good and so simple. You crack me up Michelle! Look, I don't know about raw or cooked cows milk as I simply enjoy soy but I have to say that the thought of drinking something for pets churns my belly. But that's it isn't it? 'They' don't want you to like something if 'they' have something else to sell! (can you detect a paranoid conspiracy theorist?!) Keep us posted on your adventures as an outlaw. My hubby prefers cows milk but has trouble digesting it. He's ok with A2 milk though. So I am interested to see where you end up with this jaunt, you are being my guinea pig :) . Lucky pets, will they have crackers with their cheese? The farmer labels the milk "pet use only" as that's the only way he's legally able to sell it. But it is milked, stored and tested under strict hygiene conditions as if it was meant for human consumption. Drink up and enjoy! We love our raw milk, yoghurt and cream cheese. Giving keffir a try this week - off to blitz up a smoothie now. The only time I wouldn't drink it was when I was pregnant - I tried pasteurising at home but the smell of hot milk made me terribly nauseous, so it was back to plastic bottles for a little while. You won't look back. Laughed out loud! Haven't watched those before so thanks for sharing! Raw milk talk has been a regular thing around these parts as we've been sourcing some through a friend from a dairy about an hour away. I am loving mastering yoghurt, experimenting (not always so successfully) with cheeses, and have a drop of creamy milk in my tea - so indulgent. Look forward to seeing your journey with raw milk unfold. The current situation is ridiculous! Fast food and soft drinks and cigarettes- all okay and yet there's overwhelming evidence of the harm they do. When I went looking for information on the internet about raw milk, just info, not the product, a lot of the links had gone dead- no recent activity at all. When I asked some 'crunchy' friends, they said the raw milk movement had gone completely back underground because of threats of prosecution. Apparently just talking about the issue had brought too much heat to those who were campaigning to have the issue brought out into the open and discussed rationally with a view to possibly amending the law. Oh raw milk, you lucky thing. I mean your lucky pets. When I worked at a dairy I used to get fresh milk. It is such a different flavour is'nt it. I guess a 'real' flavour, what milk is meant to taste like. I too have heard of the negatives of raw milk, but the dairy farmer I worked for grew up with it his whole life and he's 70 odd now and it hasn't done him any harm. I remember as a child our beach house was near Rocky Cape and we used to buy milk from the farmer. It was so delicious but I think pasteurized. Also when we first moved to Lw Head there was a group f us who did a milk run to Pipers river. Can't remember if the farmer pasteurized the milk r the factory. oh how lucky! i have been reading about raw milk and it's virtues in nourishing traditions by sally fallon. i want to get some of that goodness but where we live on the west coast of south oz, cows are hard to find let alone raw milk. can't wait for our move to tassie so i can find myself a farmer! I would love to get my hands on this stuff (after reading about the benefits in the book Nourishing Traditions). I have asked around, but there being no dairy farms in our area and even with a local business keen to stock it, but also with no success, I'm not having any luck. I once drank a glass of raw milk as a child and I still remember the creamy taste. It's insane that you can't buy the stuff - growing up on our dairy farm, that's what we drank & there is nothing like it at all. We didn't think much of it at the time, it was just what was there at the time. Looking back on it now I realise how lucky we were. Such good stuff. It does boggle the mind that you can buy booze and smokes, but not raw milk for human consumption. The movie clip cracked me up. I haven't tasted it, but would love to try it though. My dog (wink wink) would love some raw milk, where in Tassie do you buy it? Lucky you having a local source of raw milk. We minded a farm that has a cow a few months ago and I was continually trying to force feeding my family raw milk. Yum! I'm actually planning to get my very own dairy cow in the new year and am just a tad excited. I make my own raw milk from almonds. Soak half a kg of almonds over night, pop it all in a blender in the morning (including the water you soaked it in) then squeeze the milk through some cheesecloth. Yum yum! I broke the law last week, and we all loved it! Now I'm thinking harder about buying a community milking goat to share with a couple of families here so the kids in our neighbourhood can all share the responsibility and nutrition. And I read Real Food by Nina Plank, Barbara Kingsolver's Animal Vegetable Miracle and The Good Life by Linda Cockburn in the same month, they literally changed the direction of my life. Three women all writing good sense and driven by love, beautiful, heady stuff! Look forward to hearing your cheese adventures. We get 4 delicious litres of the stuff delivered to our fridge every week. Our farmer has recently set up a herd share arrangement to get around the silly legalities. That way we are part owners of the cow and pay a weekly rate for their upkeep, then get paid our dividends in milk. I'm a big raw milk fan, and also a big Nina Planck fan! We used to belong to a great co-op, and need to find another one. Bottoms up!!! All dairy is bad for you. I never heard of it before! Crazy laws! hmmmm, it makes me homesick for the farm I grew up on, no wonder I hardly ever drink any milk these days. The herd share idea sounds great though.....any local dairy farmers reading? I also grew up drinking unprocessed milk. I prefer to have no milk at all than processed milk. I'm glad unprocessed milk is becoming more widely available, even if it is still illegal. 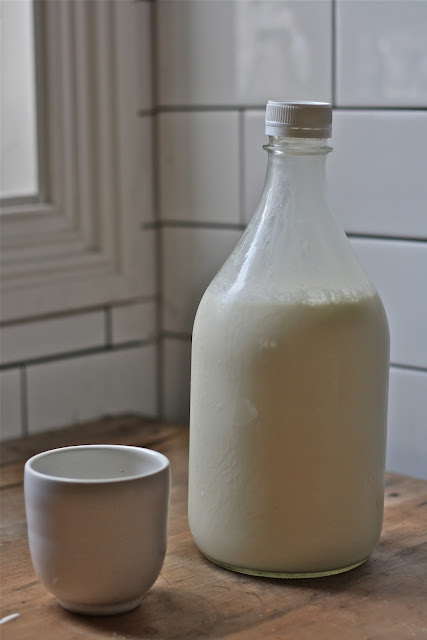 There is absolutely nothing like the taste of creamy fresh raw milk, the stuff you get in plastic bottles should not be allowed to be labelled as 'milk'. My hubby and son have medical issues and cannot drink plastic milk without severe and rapid gastric upset, but have no problems whatsoever drinking raw milk straight from our jersey cow. So far I've made butter and yogurt and hope to get started with icecream and cheesemaking in the near future. Crazy that cigarettes and alcohol are legal but buying real milk is not. How do I get some? We have an organic raw dairy here that is legal but it is ever so expensive and also somewhat of a drive for weekly stocking. I am lactose intolarant but this is fine for me!